Playing on a number of genres that range from Shoegazer to Post-Punk and Darkwave amongst others, this trio from New York have produced an eclectic, yet easy on the ear release with ‘Won’t Last’. This is mainly due to the vocals of Regina yates, reminding me of Rose McDowell on more than one occasion in their less frenetic moments. Now and again this latest release stumbles and crashes into No Wave territory, quite literally. Drums crashing all over the place and guitar lines that don’t match up, with dual vocals that are not altogether in sync; yet it all somehow works. ‘Wartime Melody’ is a beautiful piece of work vocally, and the ramshackle nature of the music behind it with male backing vocals is reminiscent of The Pogues in an altogether more drunken fashion. The beauty to this album is its chop and change abandon on a song-by-song basis. Gothic Rock sits comfortably with noise and playful bastardised pop music, and this altogether is a hard release to judge, regardless of its entirely intentional cheese factor. Think, an easier on the ear Cocteau Twins, splashes of McDowell and The Jesus and Mary Chain out of key and this will only describe some of what is on here. The only faults I guess is that this all feels a tad staged, even if it is a lot of fun. I have heard many an album by Robin Storey’s Rapoon project and most of them differ greatly; and given the mass expanse of album releases in his discography, this is of no surprise. 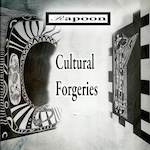 Most of his work previous that I have encountered is electronic in nature, so therefore it is interesting to note that ‘Cultural Forgeries’ is essentially an album of unplugged work, comprising of recordings made by various orchestral instrumentation and so forth. Musically speaking, when approaching such work there is the danger that a project can evolve into something less than its parts. Appreciating an album like this can prove difficult if your expectations are dashed; and the worry is that the artist will concentrate less on actual songs and focus more on a demonstration of their capabilities (or just pure self-indulgence). Unfortunately, for the most part, there is little on here to enjoy if you merely want something to listen to. For sure, Storey has an acute grasp of many an instrument and on the odd occasion I had to commend him for the task he set for himself; however, as a whole this unsurprisingly fell into a quagmire of desperate sounds that lost form or function as the album progressed. As a concept, I commend Rapoon for at least attempting something as adventurous as the task set, although I have seen this type of quest attempted on many occasion before; and it was of no surprise that the outcome would be anything less than the dull, lifeless exercise that we have here. Abstract music for people cast out from normal society, appears to be the concept for ‘Abandoned Bird Egg’, through a series of musical collages. 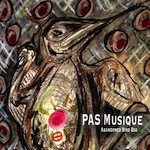 By “musical collages”, I think this is where my interpretation and that of PAS Musique differ drastically. This quartet credit the disassociation from society with song sculptures that create their own world of beauty; and soundscapes that are not defined by any convention. All I can derive from what I am listening to, is a mash-up of noises, beats and electronics with guitar work thrown into a pot labelled ‘psychedelic’ and spewed out as an exercise in how to produce a muggy mash-up of unadulterated drivel.